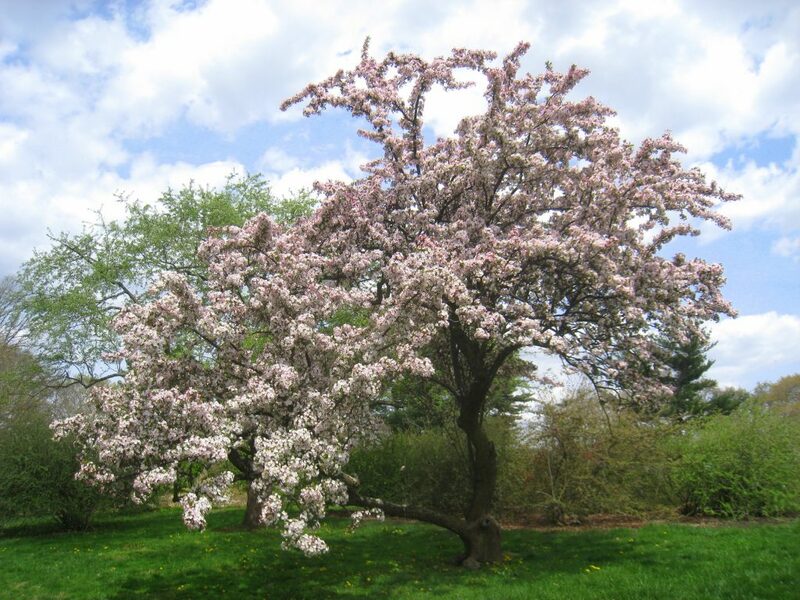 Malus hupehensis, Arnold Arboretum tree. IMG_6008. commons.wikimedia.org (Accessed 4/2017). Leaves alternate, egg-shaped 5-10 cm long, tip tapered to point, margins sharply, finely toothed; young leaves hairy on veins below, older leaves hairless; leaf stalks 1-3 cm long. 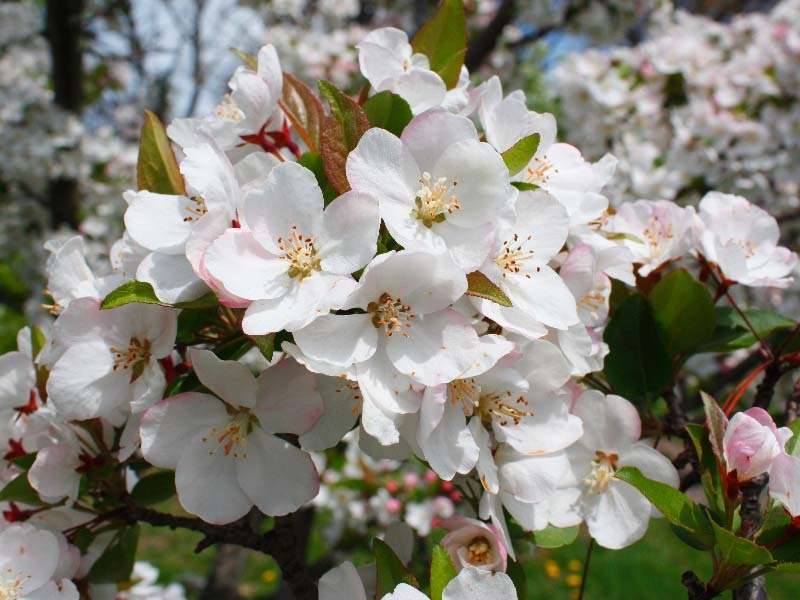 Malus hupehensis (tea crabapple).flowers. © Red Planet Inc. cirrusimage.com (Accessed 4/2017). Flowers white to slightly pink, from deep pink buds, fragrant, 3.5-4 cm wide, flower stalks slender, 3-4 cm long, petals 5, broadly egg-shaped, widest above middle, slightly notched at top; styles 3, occasionally 4; sepals purplish, triangular to egg-shaped, tip pointed, flower stalks (pedicels) slender 3-4 cm long; inflorescences of 3-7 flowers in umbrella-like clusters. 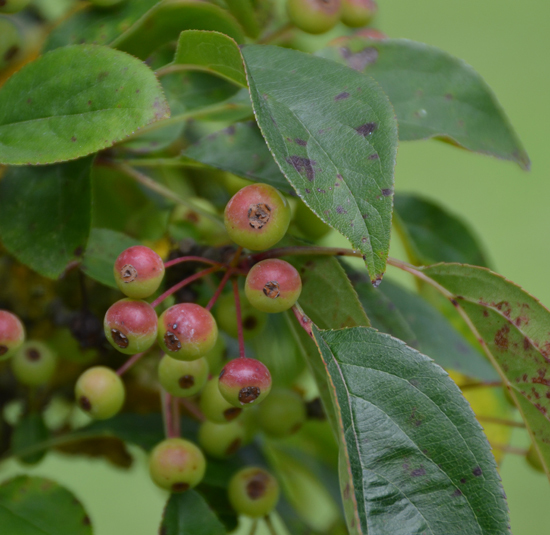 Malus hupehensis fruit. W. Mark, J. Reimer and C. Stubler. The Urban Forest Ecosystems Institute (UFEI). selectree.calpoly.edu (Accessed 4/2017). Fruit yellow green with red sides or entirely red, about 1 cm wide. flower parts mostly deciduous (Rehder 1990; Dirr 1990; Gargiullo personal observation). Habitat: Escaped from cultivation or in overgrown old house sites.